Editor's note: Susan Hill is a fitness trainer, CHEK golf biomechanic and sports nutrition specialist. For on-line golf specific exercises and stretches, visit wwwfitnessforgolf.com. This is the age of reality shows and dramatic transformations. You're never too old or too young to take care of your health and fitness, especially as it pertains to golf. For those of you who have been exercising for years, it's time to put aside those old routines in favor of what's really "hot" as well as functional for golf. How you structure your golf fitness program is essential to your overall performance on and off the course. Specific to golf: Get rid of the traditional gym machines which focus on isolating specific muscle groups and require no stabilization work by additional muscle groups. 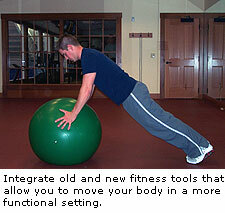 Integrate some old and new fitness tools which allow you to move your body in a more functional setting. These include cable machines, fitness balls, medicine balls, balance disks, traditional dumbbells and don't forget about the power of using your own bodyweight. 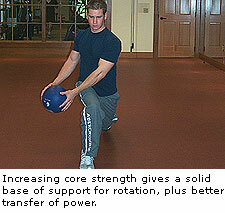 Increase core stability: More efficient movement creates more efficient power. Golfers maintain an athletic posture over long periods of time and require both trunk and core stabilization and endurance. By increasing your strength and endurance in the core region of your body, you provide both a solid base of support for rotation in addition to the proper transfer of power throughout the body. Vary your planes of motion: A golf fitness program will have varying planes of motion as part of your weekly strength routine. Planes of movement include front-to-back motions, left to right and rotational exercises. Some good examples include multi-directional lunges and medicine ball wood chops. Integrate multiple elements into each exercise: Each weekly workout should address all of the important elements for golf including flexibility, core development, balance, strength and power. Integrated training techniques will develop your skills in each of these areas and produce a whole new level of play. Examples of integration include a five-minute dynamic warm up, a 30-minute strength routine, followed by 10 to 15 minutes of stretches. Each workout can be broken down into strength development for several weeks, core stabilization for several weeks and power development as you move into peak season. Progress from simple to complex: Begin your exercise program by mastering the simplest forms of exercises first. Progress your golf training design to increase in complexity as your body grows and develops and as you learn proper stabilization of your core region. An example of progression for the legs may be to perform two-leg ball squats prior to performing the one leg version. Progressive resistance: Strength should be developed in a progressive manner. In order to get stronger one needs to progressively add resistance over time relative to previous workouts. Strength gains are made slowly, but consistently and you will see the difference in your game in no time. In the absence of progress with your program, you're limiting your potential. Now is the time to give your old exercise routine a new golf fitness makeover. Begin by implementing these simple strategies and you'll see improvements in your golf game in no time. Not only will you be using some of the same exercise tips as the top touring pros, but your body will feel the difference and your golf game will show it. Susan Hill is a fitness trainer, CHEK golf biomechanic and sports nutrition specialist. For on-line golf specific exercises and stretches, visit www.fitnessforgolf.com. Any opinions expressed above are those of the writer and do not necessarily represent the views of the management. Keep those Muscles and Joints Flexible All Year! My fundamental instruction message for fellow golfers is that you may not be able to control what happens to you on the golf course but you can control how you react to what happens. Ignoring your emotions is impossible but you can definitely manage yourself once they happen.